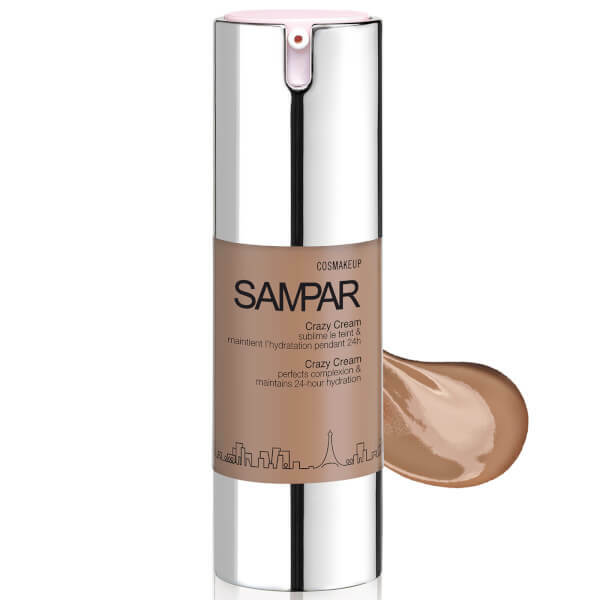 Protect and perfect the complexion with the SAMPAR Crazy Cream in Tan; a lightweight, tinted moisturiser that delivers long lasting hydration, whilst protecting the visage from photo-ageing UV rays. The silky formula glides onto skin, absorbing quickly to deliver an essential veil of moisture. Utilising a Hydrocomplex, the Crazy Cream ensures skin appears supple, firm and comfortably hydrated, whilst the addition of Adenosine boosts skin’s collagen levels to assist in reducing the appearance of fine lines and wrinkles. The moisturiser also boasts Smart Sun Prevention to shield the complexion from harmful UV’s and in turn prevent signs of sun damage and photo-ageing. Offering both skincare and makeup benefits, the tinted formula perfects the complexion with its tan hue, which is ideal for medium skin tones. The product can be worn alone for a naturally flawless-looking finish, or can function as an effective base for a makeup routine. However the product is used, the Crazy Cream guarantees to deliver a radiant and unified finish. Take a small amount of product and apply starting from the middle of the face and spreading toward the contours.